The basis for Green Squared product certification: Click below to visit the TCNA website for purchase. 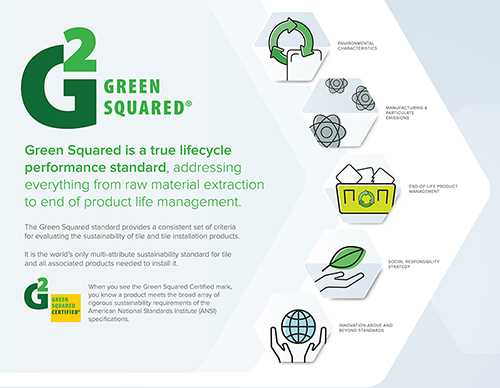 Green Squared® was drafted by TCNA's Green Initiative Committee, a volunteer group of industry stakeholders, and submitted to ANSI Accredited Standards Committee (ASC) A108 for further development and finalization. ASC A108 represents manufacturers, distributors, installers, green building professionals, and other relevant interests. 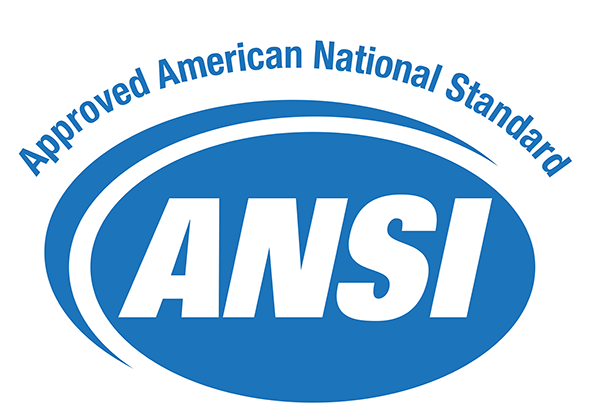 The result was ANSI A138.1 Green Squared - American National Standard Specifications for Sustainable Ceramic Tiles, Glass Tiles, and Tile Installation Materials. 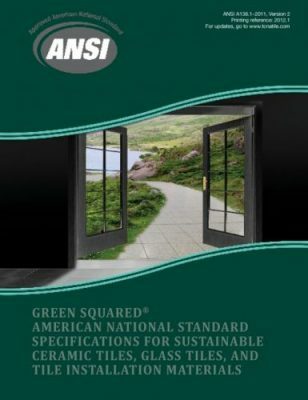 ANSI A138.1 is modeled after other respected green building product standards. Since being green today involves much more than use of recycled materials, energy efficiency, or any other single attribute, ANSI A138.1 takes a multi-attribute approach to sustainability. The standard addresses product characteristics, manufacturing, end of product life management, corporate governance, and innovation, and it establishes the spectrum of environmental and social criteria most important to today's green building world. Some criteria are mandatory, and others are elective. To meet ANSI A138.1, a product must meet all mandatory requirements and obtain a minimum threshold of elective credits. Credit weighting of each elective is based on ANSI ASC A108 dialogue which took into consideration both stringency and environmental relevance. That Covers Products, From the Substrate Up. ANSI A138.1 covers a variety of products including ceramic and glass tiles, powder goods (grouts, mortars, etc. ), liquid and paste installation products (trowelable membranes, liquid polymer additives, etc. ), panel installation products (backer boards, underlayments, etc. ), and sheet installation products (crack isolation membranes, waterproof membranes, etc.). This allows the industry to offer installed systems of conforming products, the only offering of its kind by any building material industry. ANSI A138.1 enables stress-free specification of sustainable tiles and related installation products. It navigates through the complexities of leading North American sustainability principles by packaging together a variety of criteria and establishing a clear and consistent "bar." This makes ANSI A138.1 a valuable and convenient tool for architects, designers, and consumers as it eliminates the hassle of cross evaluating single-attribute sustainability claims. Green Squared is built on five main criteria: Product Characteristics, Manufacturing, End of Product Life Management, Progressive Corporate Governance, and Innovation. The first section of ANSI A138.1, Environmental Product Characteristics, standardizes sustainable attributes such as the amount of recycled content, level of volatile organic emissions, amount of indigenous raw materials, etc. The second section of the standard, Environmental Product Manufacturing and Raw Material Extraction, standardizes sustainable production practices. The third section of the standard addresses End of Product Life Management. Although a tiled finish is inherently durable and typically desirable for a lifetime, there are some scenarios where this must be addressed, such as when buildings are demolished, scrap waste is generated during construction, or an occasional remodel occurs. The fourth section of ANSI A138.1 addresses Progressive Corporate Governance. This means that companies which make sustainable tiles and related installation products are held to standards for employee health and safety, community involvement, and continuous improvement. The final section of the standard addresses Innovation. Key in the development of sustainable products and operations are progressive thinking, technological advancement, and outstanding achievement beyond that which is required. Whether you’re specifying a large commercial project or overseeing a weekend remodel, selecting products per ANSI A138.1 will help you meet project requirements and facilitate healthier, safer, and more environmentally-friendly installations and product supply chains. Tile and the gamut of related installation products which meet ANSI A138.1 offer professionals a panoply of opportunities for technical criteria conformance under leading national and international green building standards and programs. Some of these include LEED v4, Green Globes, the NAHB National Green Building Standard, ASHRAE 189.1 and the International Green Construction Code. Tile products are typically hypoallergenic and mold, mildew, fungi and bacteria resistant. Plus, they are non-emitting and crafted from inherently natural materials. ANSI A138.1 standardizes all of this, and specifying conforming products ensures that these high expectations are upheld. Specifying ANSI A138.1 means you are requiring the use of products which come from companies that implement safe and responsible practices per the standard. Furthermore, products which meet ANSI A138.1 inherently meet industry quality and performance specs that address things like slip resistance, durability, and sound isolation. From resource conversation to carbon footprint, when you specify ANSI A138.1 you are demanding stringent environmental criteria of tile products and the manufacturers which make them. In turn, you are doing your part in contributing to a clean and sustainable tile industry. Some examples of standardized environmental criteria include recycling and waste reclamation, use of indigenous raw materials, manufacturer combustion and fuel usage, raw materials sourcing, manufacturer utility usage, and lifecycle-based environmental evaluation and reporting.